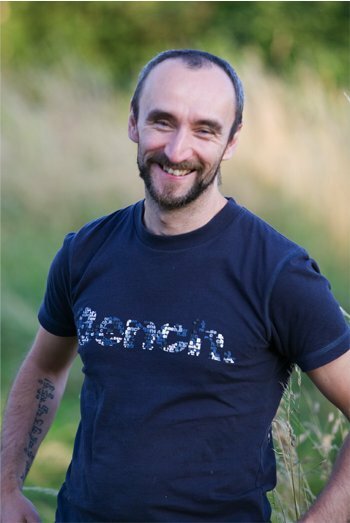 Hi, my name is Arthaketu, an English-speaking shiatsu practitioner who has recently moved to Berlin. I will begin my practice by offering shiatsu in English and this will change as I learn more German. Shiatsu can help with many conditions including back pain, stress, headaches, migraines, whiplash injuries and neck stiffness, joint pain and reduced mobility, menstrual problems, digestive problems, asthmatic symptoms, sports injuries and depression. 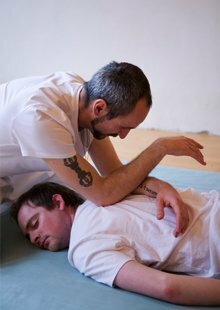 My style of shiatsu is responsive – it can involve deep penetrating pressure with soft supporting touch helping you to release tension, feel more grounded, relaxed, re-vitalised and connected to your body and heart. I trained at the Yorkshire school of shiatsu with Julie Shearn and qualified as a practitioner in July 2003. Since then I have been practising professionally in Manchester, UK, where I still practice every few weeks. I also took the exams of the shiatsu college which enabled me to receive the Shiatsu Society’s external qualification M.R.S.S. My interest in shiatsu came about through wanting to integrate my work with my practice of Buddhism and meditation. I wanted a job that was ethical and of benefit to society. I also wanted to develop the qualities that I had already found in meditation and Buddhism, such as groundedness, kindness and awareness, and to share these qualities with others. What I like about shiatsu is its diversity. It can be very physical, or very soft. The pressure used can be very deep and penetrating or light and gentle. It can involve a lot of movement in terms of stretches and rotations and it can also be very still. Shiatsu practice addresses itself to the individual in the moment. It is deeply relaxing to receive and can allow us to switch off from the stresses and strains of our day to day life. Shiatsu can help with many conditions including back pain, stress, headaches, migraines, whiplash injuries and neck stiffness, joint pain and reduced mobility, menstrual problems, digestive problems, asthamatic symptoms, sports injuries and depression. Is shiatsu performed on a massage couch? No a shiatsu treatment takes place at ground level on a futon (a padded mat). What if I can't lie down? That’s not a problem as shiatsu can also take place on a chair. No, a shiatsu treatment takes place with the client fully clothed. What does shiatsu training involve? Shiatsu training takes three years to complete. My training involved learning about anatomy, physiology and pathology. In terms of shiatsu itself the main focus was on Zen shiatsu and 5 element theory. Since qualifying I have undertaken various post-graduate courses and has developed my understanding of TCM (traditional chinese medicine). How long does a shiatsu session last? A shiatsu treatment lasts approximately one hour. The first session is usually longer because I will take a detailed case history to develop a complete picture of your health according to the principles of oriental medicine. * Concessions are sometimes available, so don’t to be put off by the price. If you genuinely can’t afford a treatment but feel like you would benefit please contact me, you are worth it. I would be happy to discuss with you a package for the employees of your business. I began my interest in Shiatsu in 2000. This came about for a number of reasons: I had been practising meditation and buddhism for 9 years and had also began practising Aikido, had tried out some tia chi and chi gung and had done a massage weekend with Vajradaka. What all these practises had shown me was that by relaxing the body you effected the mind. The other thing that they had in common was that they worked with the energetics of the body. It was on the Tai chi and meditation retreat and the massage weekend with Vajradaka that I found out that I could experience the energy of someone else and effect this to help in the healing process. My training included working with a number of teachers including Nicola Pooley, Paul Lundberg, Daverick Leggett and Akinobo kishi. I completed my training in 2003 with the Yorkshire school of shiatsu with Julie Shearn. Since qualifying I have continued to enjoy learning more. Reading up about various topics. Doing shiatsu residentials run by the shiatsu society and the shiatsu college. I have also done various weekend and day workshops. Doing courses with people like Cifford Andrews and Carola Beresford Cooke. In 2005 I was ordained into the Triratna Buddhist Order where I was given the name Arthaketu (R ta K 2). Which means ‘leader in the meaning’ or ‘leader in the good’. Since I have been ordained I have co led retreats and regularly taught on the Buddhism and meditation courses and meditation courses run by the Manchester buddhist centre. One of my other interests has been Aikido and for many years I practised Aikido under Sensie Kolashnikov eventually attaining my first dan (black belt). Arthaketu has a very reassuring touch. Sometimes gentle and at other times firm; however I find the pressure one of the most enjoyable aspects of this type of massage. Arthaketu will often explain the nature of his treatments as each one feels quite unique in itself. I find Arthaketu a gentle and reassuring therapist. His calm and tender manner is most comforting. His knowledge of Chinese medicine is most helpful in my attempts to ‘Treat’ any symptoms by adjusting my diet and lifestyle. Arthaketu also manages to create a lovely peaceful and tranquil feel to the treatment room and the treatment itself. I have experienced many holistic therapies but the thing that really struck me about Arthaketu’s shiatsu was that although physical it quietened my mind – something that I haven’t experienced before whilst receiving a treatment. I am the sort of person that has high energy levels and high stress but during the treatment I felt light and fell asleep. This was surprising for someone with a busy and active mind. For several days after the treatment I slept really well and my energy felt balanced. I turned to Shiatsu 7 months after the birth of my son. I’d had persistent headaches since the day he was born, eventually diagnosed as ‘Chronic Tension’. After my first treatment of Shiatsu my headaches went for 2 weeks! I went on to have five further fortnightly treatments and my headaches are 98% cured. It’s just been amazing. Shiatsu is a fantastic, gentle treatment that I feel fortunate to have received. I continue to have treatments to keep me in balance and feeling energized and would definitely 100% recommend it to anyone who will listen!